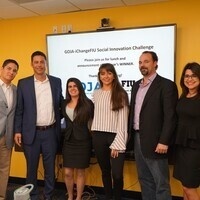 The GOJA-iChangeFIU Social Innovation Challenge is the newest program at the Center for Leadership and Service. It is a partnership with FIU's Center for Leadership and Service and Walter Gonzalez Jr., the President of GOJA LLC, an online e-commerce company that ships thousands of orders each day to customers all over the world. iChangeFIU is a social impact program that strengthens the capacity of students to develop innovative solutions to complex social problems through social entrepreneurship. Our overall mission is to create a space where students can learn about social entrepreneurship, pitch an idea to a panel of informed judges, provide mentorship, and earn a chance to win a scholarship prize provided by GOJA to help kickstart those ideas. To apply visit leadserve.fiu.edu and click Funding Opportunities.